Kidz Lab - Kitchen Science | A Fun Filled Kitchen Science Kit! 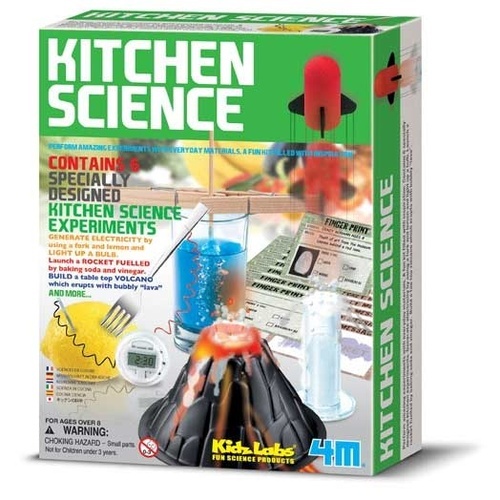 With the Kidz Lab - Kitchen Science kit your kids can perform amazing science experiments using everyday materials from your kitchen pantry! There are 6 specially designed experiments to help you or your class learn about crystals, electricity, chemicals and more! Launch a rocket that is fuelled by baking soda and vinegar, build a table top volcano that erupts with bubbly "lava", generate electricity using a fork and a lemon, and use black currant juice to decipher hidden messages! There's oodles of fun to be had with this kit, and so much to learn from the detailed stories and fun facts along the way! - 2 x Zinc plates with wire, and a clock watch. There are also a number of basic items that you may need from your kitchen at home including vinegar, baking soda, food dye and corn starch. Just remember, it's always best to ask permission and assistance in getting these materials organised! Recommended for ages 8 and up.colours and contents may vary from those illustrated. Adult guidance recommended, please read instructions prior to use.